Hyrum was the most excited of all the kids to do his shopping--it's kindergarten, after all. 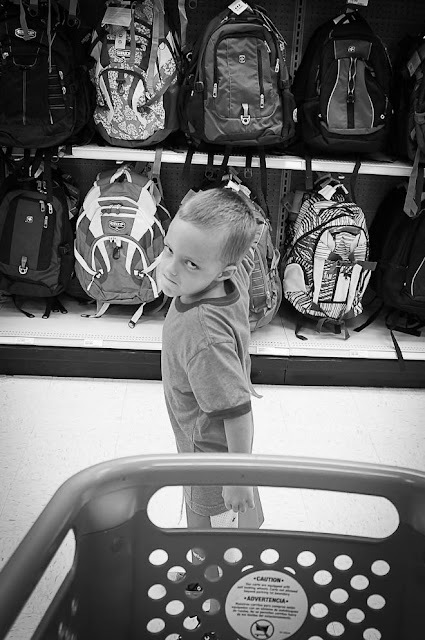 He wasn't very happy (above) when I told him I'd buy him a Justin Bieber backpack. 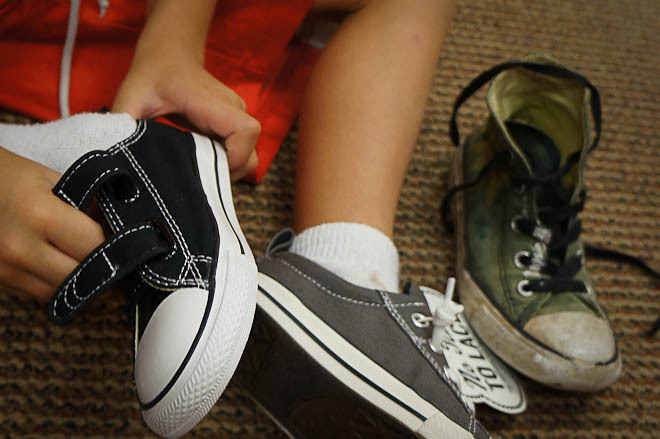 All summer long Hyrum has described to me the red high-top Cons he was going to buy. Red because they're his favorite color and high-top because they're cool and Cons because--is there anything else? What I learned about Hyrum? Hyrum has the widest feet of any of my kids. 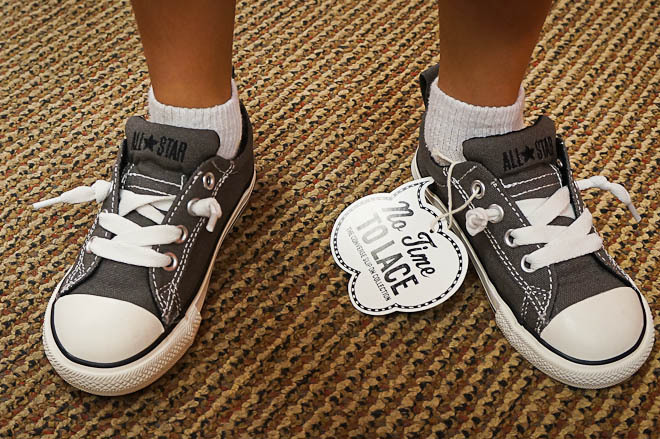 So wide, in fact, that he should wear a size 9, but in order for the shoe not to "SQUEEEEEZE" his foot, we had to buy him a 10. And there were no red Cons in a 10 wide. Grey Cons that are intended to be worn cool and loose and untied. Now, with new laces long enough to tie and still one size too long. At least they're still Cons, and he's happy with the no "SQUEEEEEZE" factor. 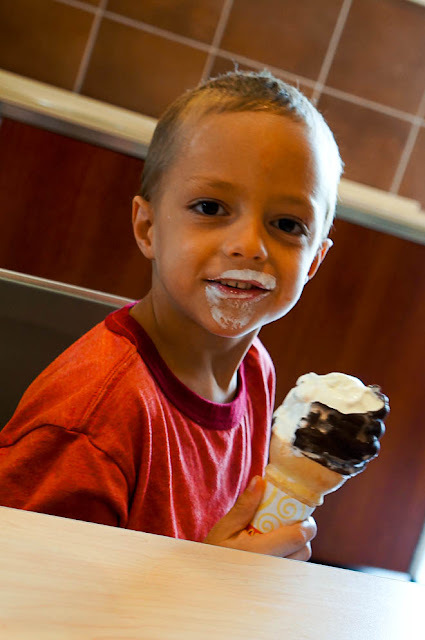 And about the new dipped ice cream cones at McDonald's? Yeah. Yum. Hyrum is ready for kindergarten--ready to be big and wear a black backpack with a lunch box strapped to it. Ready to eat lunch at school. Ready to play on the playground and go to PE. The question is, is kindergarten ready for Hyrum? Ready to teach him following directions is necessary. Ready to teach him kindness begins with him. Ready to teach him to sit still and listen and be calm. Luckily, I know his teacher, and she told me when she was Micah's teacher that if she were allowed, she'd request a full classroom of kindergarten boys every year because she loves them so. She may be singing another tune after this year. Rum, my little love. You have me wrapped around your finger most of the time. Kindergarten, watch out! Aw, little Hy... I can't believe he's going to kindergarten! I can't wait to see you guys soon! Bryce won't be going this year because he was born in November and now they hold those kids back. So he will be in a special pre-K at the public school.